Do we want our children to live in a world stinking of diapers and covered in plastic? We hate to be all doom and gloom, but there’s an ecological crisis happening right under our noses and it smells like dirty diapers! American babies soil 27.4 billion diapers annually and generate 7.6 billion pounds of trash. That is enough garbage to stretch to the moon and back NINE times! These plastic disposable diapers take over 500 years to biodegrade in landfills, and that is so long that the diaper you wore as a baby will outlive your great-great-granddaughter! Plastic disposable diapers should be a major concern for all parents because your baby is wearing them 24/7 during a vital time in their development. Disposable diapers are made of polyethylene, or in simple terms, PLASTIC. Polyethylene is actually the same plastic that is used to make grocery bags. It takes one cup of crude oil to make the polyethylene plastic for one baby. That adds up to 3.4 billion gallons of oil every year to supply diapers for babies; enough to power 5,222,000 cars! Most plastic is made from fossil fuels like oil and natural gas, which release toxic emissions when extracted from the earth. Two hundred thousand trees are lost each year to the manufacture of disposable diapers for babies in the U.S. alone. Not only are disposable diapers dangerous to our planet, they are dangerous to our babies as well! Diaper companies do not have to disclose the ingredients used in your baby’s diapers! So many parents just like you do not know the true facts about diapering your baby in disposable diapers. In order to make your baby’s diapers feel soft, diaper companies use a plastic softener called phthalate. This chemical acts as an endocrine disrupter, which can cause cancerous tumors, birth defects, and developmental disorders in your precious baby. The most dangerous chemical found in almost every disposable diaper brand on the market today is dioxin: a carcinogenic chemical that is a toxic byproduct of the paper-bleaching process. In addition to cancer, dioxin has also been known to cause birth defects, skin and liver disease, and genetic damage in lab animals. 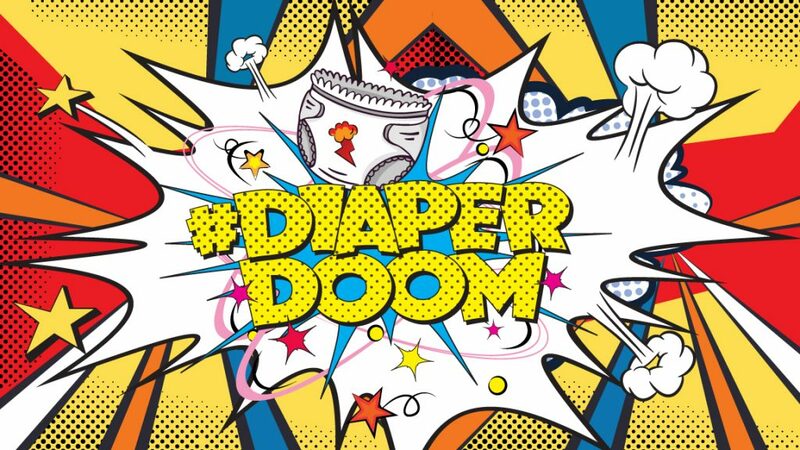 Now you know why we’re called Diaper Doom! Diaper Doom is an advocate for ending the use of plastic disposable diapers because we cannot stand the stench any longer! We feel it’s time to air out the disaster that is the diaper industry! Follow Diaper Doom on Facebook, Instagram and Twitter to keep up with our mission. Something has got to change!